Just in time for Valentine card exchanges, parties, and festivities, I have created a Valentine’s pencil fun page. 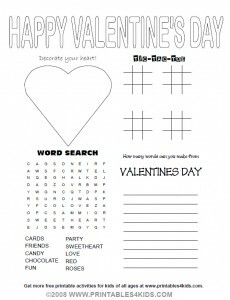 This printable Valentine’s page has four great activities on one sheet – decorate your heart, tic-tac-toe, a word search and how many words can you make. Click on the image above to view and print the activity sheet full size or download Valentine’s Activity Sheet as a PDF file. Perfect for Girl Scout meetings, a reward for getting classroom work done, goody bags, adding to Valentine’s cards or just because! Have fun! Get more Fun Printable Valentines Games – Looking for Valentine’s party favors? I personally love these! These are great Valentine’s Day activities!